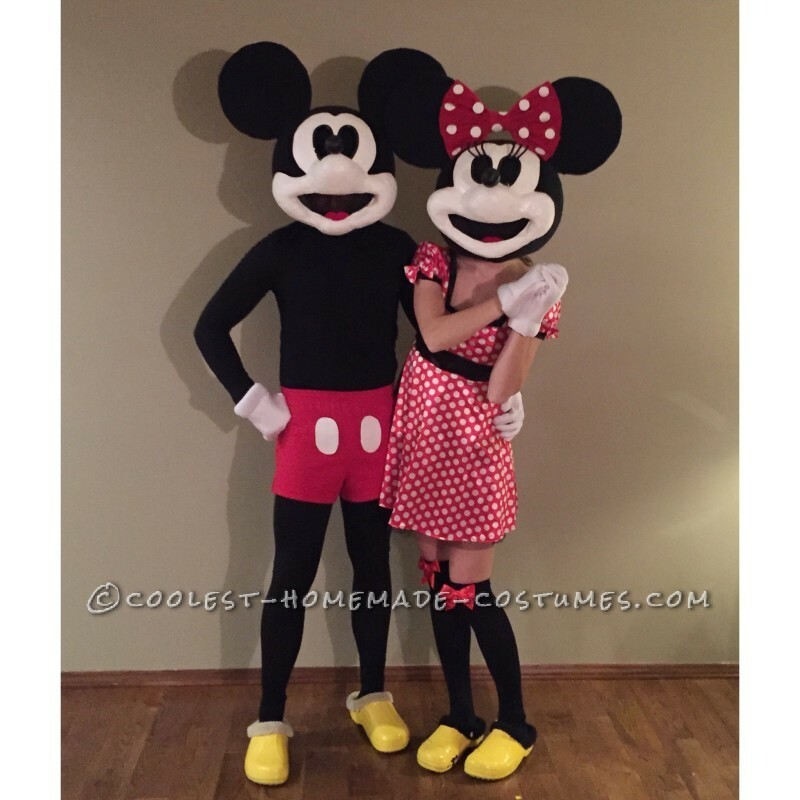 A month ago, we decided we wanted to do a vintage Mickey and Minnie Mouse costume as our first homemade couples costume. 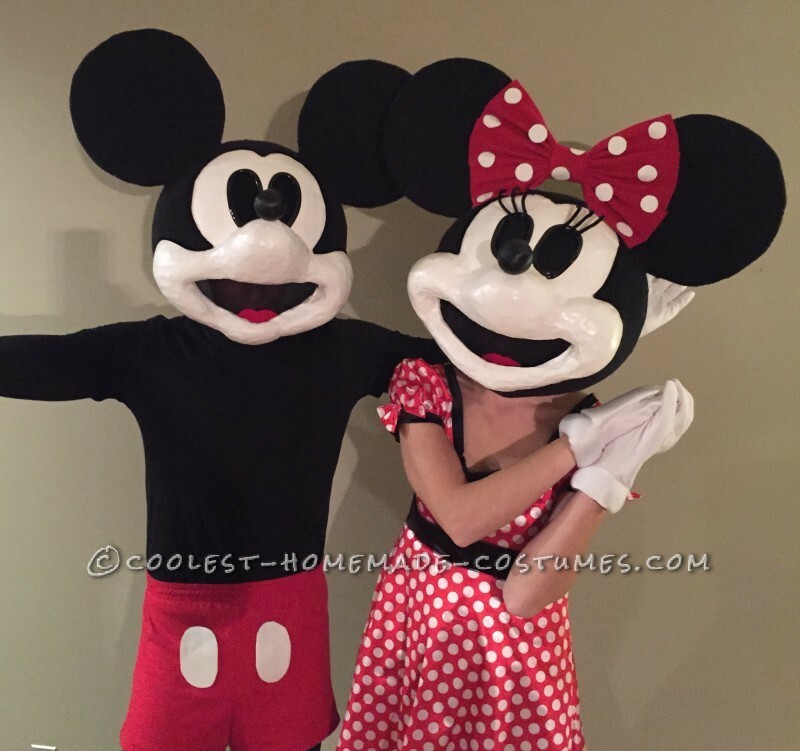 My boyfriend is quite creative and he had the idea of doing huge Mickey and Minnie heads on our little bodies. The process of making the heads took about two weeks of long evenings working on it. It all began with a ball. We found two of those huge balls that you often see locked up in bungee cages at Walmart that kids want to knock down and we used our elementary paper mache skills to paper mache around the ball. We did this about four times before my boyfriend thought it was sturdy enough. After it was dry, we popped the ball inside and the paper mache magically held its round form without the ball. Then began the hard part. Although I was happy to be mostly done with the horrid smell of paper mache in my nostrils and the sticky fingers, that was the easy part. Next we cut out cardboard into circles and put metal rods in them to keep them sturdy and drilled them into the head. We knew we would get touched a lot at the socials we planned on going to so we needed to make sure none of our parts would fall off. Then began the worst. 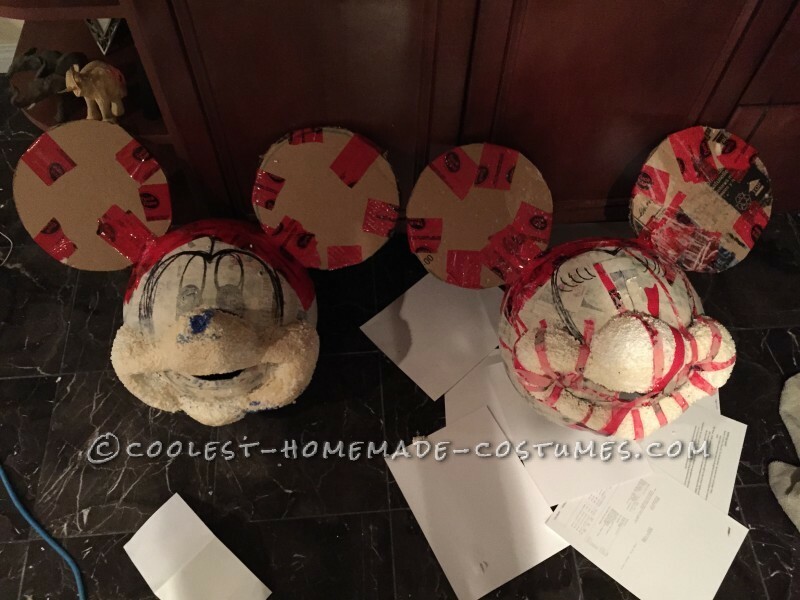 Trying to mold Styrofoam beads into the mouth, nose and cheeks of Mickey and Minnie Mouse. Let me tell you; it fell off more times then we can remember. Although it molded well, it was beyond hard to keep the beads from falling because of how light it was, and from melting because of the “hardening” materials we were trying to use to keep it up. We tried glue, and it fell off. We tried paper mache, it fell off. We spent hours in Rona looking for something that would hold it up without eating through it and we couldn’t. At this point things were tense and frustrating and we didn’t know if we could really do it. We decided we would just mist glue on so it doesn’t get completely soaked and then tape the rest up. That seemed to work so then we did a final layer of paper mache over that (thank goodness that’s over with) and then moved onto the more easy, decorative activities. We spray painted the heads completely white, and bought black shaggy fabric to upholster around the black parts of the heads. 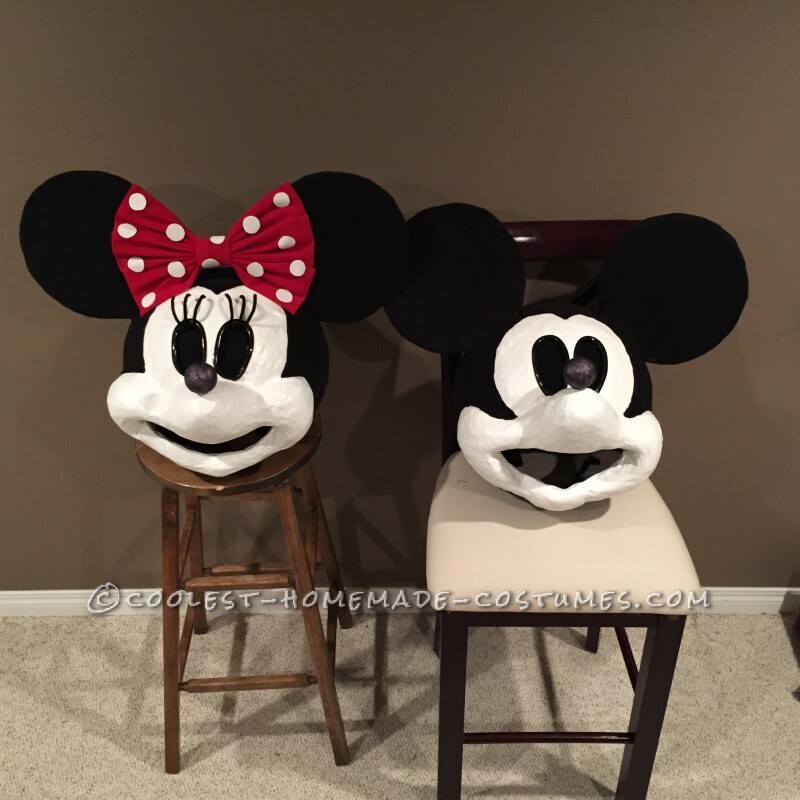 After many glue gun burns later we finished the basics of the head and moved onto the eyes, nose, and for Minnie, the bow. The eyes gave us a little trouble, we used the plastic you use to line your windows in vehicles to line the eyes so they stand out and they are more sturdy. Minnie used black pipe cleaner to give her that “maybe it’s Maybelline, or maybe it’s black pipe cleaner” look. The nose is a Styrofoam ball painted black that is Velcroed onto the face. Heaven forbid any store in the city would have a plain, big, red bow. Luckily, some retailers like to put Halloween and Christmas stuff out together (thanks Dollerama) and we used a Christmas bow and I cut out white felt dots and glued them to the bow. The rest of our time was just adding finishing touches and fixing the many mistakes we made. The best part of the whole process was definitely seeing the finished product and how good it looks. There were many times where I was doubtful that it would even turn out looking like a mouse but it was a relief to see the end product. The funniest part was making it with my boyfriend. We aren’t usually a couple who fights often at all, and when we were making this we seemed to bicker like an old married couple so often because of the high tensions in our crafting modes. He’s a perfectionist and I just wanted to get it done and the contrast brought out so funny name calling and childish behavior. We wore this for the first time last night on Halloween day at a social. There was no contest prize for best costume unfortunately but to see the reactions of people when they saw us was well worth it. We were like local celebrities! Everyone wanted a picture with us, we got many high fives and thumbs up, and when we would walk into an area people had their eyes on us, pointing. It seemed like people were generally happier to see us. We will be going out again tonight to a place with a prize so we are crossing our fingers! Thanks for reading, and Happy Halloween everyone!